Halloo - Can I send alerts to my cell phone when I get new messages? Can I send alerts to my cell phone when I get new messages? Yes! You may configure the Halloo service to send you a short message (SMS) to your mobile phone each time a caller leaves you a message. The caller-ID and message length are sent to your mobile phone, so that you can quickly determine who called and whether you need to respond immediately or at a later time. 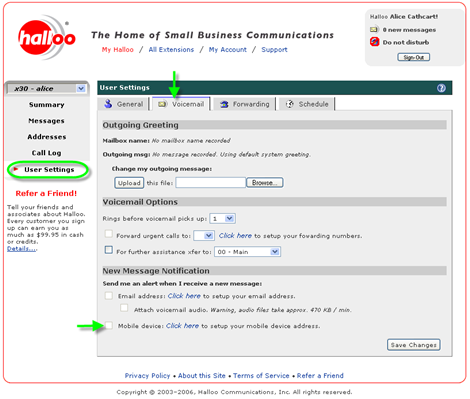 In the User Settings tab of the My Halloo website, select the Voicemail tab. Locate the heading New Message Notification. Check the Mobile device option under the New Message Notification section as shown above.